I get so many e-mails, tweets, anonymous Formspring questions, and comments asking what make-up products do I use. Well, this post is for all of those inquiring minds. These are the products that I use daily to create a simple look. 11. MAC Satin Lipstick in Snob This is the best moisturizer for my dry skin day and night. You only need to use a dime size for your entire face. I apply this before I put on my make-up. This is great for those with dry skin. Definitely was well worth $33. The saying "good things come in small packages" is so true about this small bottle of primer. It has a pinkish color, but smoothes on the skin translucent. I apply this before I put on foundation and concealer. I wear a liquid foundation and I put the mineral powder on top to finish the look. Using a foundaiton brush, I apply the Maybelline Dream Matte Mouse, which is full coverage. It feels so soft on top of my skin. After I put on my NC50 concealer, I use a kabuki brush to apply the mineral powder. The concealer is so a nice texture and is full coverage. I use this to cover my nose, which is a problem area for me and to cover pimple scars and other blemishes. I use the L'Oreal True Match concealer wand as an undereye brightner. It makes the eyes look well-rested and brighter. It's very blendable. Sometimes I put this on after I put on both foundations. 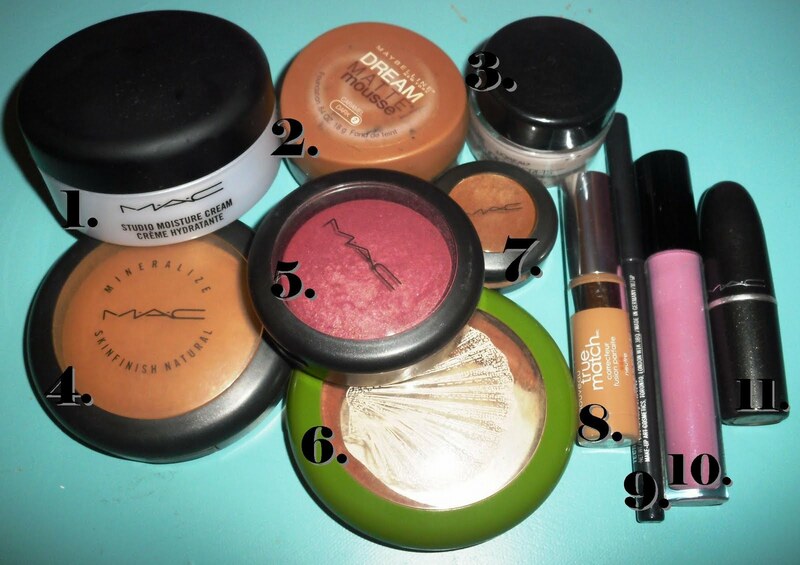 Last, I apply my favorite cream bronzer (it's almost at pan) and then blush. I recently purchased "Love Thing" blush, which has gold and fuschia tones. A little goes a LONG way. It is highly pigmented. Snob is my new favorite everyday baby pink lipstick. It looks even better with the Going Casual gloss on top. The above swatch is of Snob. I didn't include my favorite mascara, Maybelline Lash Stiletto, in the collage photo at the begininning of the post. The red tube is Lash Stiletto Voluptous, which has a curved brush to add volume and plumps your lashes. Everyone always asks me if I have fake lashes when I wear this mascara. I only wear eyeliner on the bottom lids (mainly if I go out, not in the daytime).